Ski-in/ski-out to all of Big Sky/Moonlight Basin from this 3 bedroom/2.5 bathroom + bonus room Saddle Ridge. Only steps away from the Moonlight Lodge, restaurant, bar, pool, and fitness center (see Moonlight Club details below), this chalet offers all of the comfort that you could possibly want, with a true Montana rustic feel. It is equipped with brand new carpet throughout (fall 2018), a loaded kitchen with all appliances and cooking needs, private wifi, gas grill on the deck & a sled for afternoon fun + flat screen TV's throughout, including a new, 55 inch TV in the living room (not shown in pictures). You can watch your kids sled from your back deck as you soak in the hot tub while enjoying the beverage of your choice. 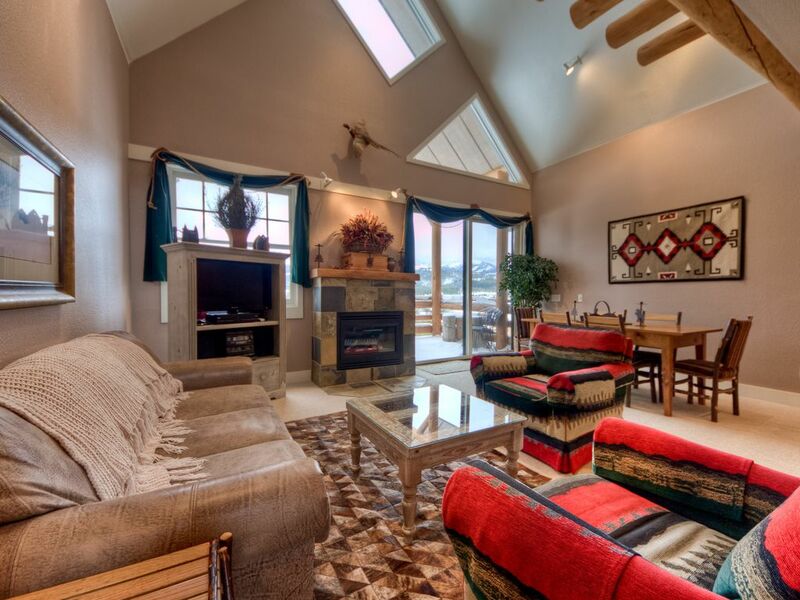 The Montana Mountain Chalet ski-in/ski-out multi-level Saddle Ridge sleeps 8-9 people (7 adults max) and promises to provide the cozy escape to the 'TOP of the World' that we are all looking for. The master suite is on the top level and the other 2 bedrooms, bonus room, and full bath are on the lower level. The outdoor private hot tub looks out at breathtaking mountain views. The main level boasts vaulted ceilings in the great room with rustic log accents, a flat screen TV, a gas fireplace, dining area, and open kitchen with breakfast bar. **We rent 26 ski-in/ski-out properties, all in Moonlight Basin, so if this property is not available, please contact us about our other properties. MOONLIGHT CLUB MEMBERSHIP - This home is owned by a Moonlight Club member and offers access to the private Moonlight Club Member Only amenities, including the Moonlight Lodge. Access is completely optional and only applies if you choose to pay the fee and access the Club during your stay. If access to Club amenities is desired, a family pays for the duration of their visit. If not arranged prior to arrival (you can call Moonlight Member services in advance), guests will visit Moonlight Club Member Services (located at the front desk of Moonlight Lodge) to check in, learn about what is available to them as a rental guest, and pay the amenity access fee for each day they are on property, fees waived for arrival and departure days. Please note, in addition to the standard rate, there is a service charge and resort tax. ** We manage this privately owned home. We do NOT manage the Moonlight Club or Club policies. The amenity options and pricing listed above can change at any time without notice. Condo was as-advertised and the owners very friendly and responded quickly to all of our needs during our stay. We went with a group of seven. The condo met our needs. Inside was in great shape. The hot tub felt good every evening. We cooked two nights and found the kitchen to be adequate. Slopes/lift is just a few minutes walk away. Would stay there again. We loved our stay at this townhouse in Big Sky. The unit is tastefully decorated and the jacuzzi on the back porch hit the spot when we returned from our daily adventures on the mountain. The location was absolutely perfect. It was so easy to ski in and ski out. We also enjoyed the Moonlight Basin Lodge. It's absolutely beautiful and their amenities really enhanced our stay. While there we took advantage of the restaurant as well as the spa and pool. We will soon return! Awesome view of Beehive Basin to the north and Lone Peak to the SW! Roomy and clean. Very homey. Amazing location, spacious, perfect for 6-8 people! Location: 1 minute walk to the Moonlight Lodge (literally walk across the parking lot), which is right next to the drop-in for the ski-in down to the lifts. You can grab your lift tickets here, there's a lovely restaurant/bar for an apres, and the view is spectacular. There are also shuttles that run back/forth from the main Big Sky Resort base (mountain village) as well as downtown Big Sky. The house: has everything you need, spacious enough for 8 people. The "bonus room" is actually a full bedroom - though it's a bit small, it has full privacy. Communication: Acra is extremely responsive, pre-, during-, and post-trip. Can't ask for a more responsive and helpful owner. 13% applies to taxes/fees 50% due at the time of reservation and remaining balance due 30 days prior to arrival date. We accept Visa, Mastercard, Discover, American Express. Damage Protection Plan covers up to $1500 in unintentional damages to the rental unit interior during your stay.